who were the founding families in town? The first 23 Freeholders in Andover as they came to town is called the Faulkner List. Descendants of some of these founding families still live in town. What is the oldest building in North Andover? This frequently asked question does not have a simple answer. It can be said that several buildings in town contain fragments of very early structures, but no single building is an intact survivor from our town origins. The town was laid out as available to settle by English colonists by the Massachusetts Bay Colony in 1635, and it was called ‘Cochichewick Plantation’. Development was slow, given how far in-land the location was from the ports and established communities of the coast. In 1642 when Essex County was created, the village of Cochichewick was included on the list. Andover become a growing community in 1645 when a church was finally convened in a purpose built meeting house. None of those initial wooden structures remain from the first wave of settlement in the 1650s-70s. There are some elements of late 17th century or “First Period” elements in over a dozen houses in North Andover. The list below is from Stephen Roper’s A Good In-Land Town (2001) available in the Gift Shop. More information is provided there. Yes, the Great Pond, now known as Lake Cochichewick, was a great draw for seasonal camping, hunting and fishing. They were the Pennacook people, part of the Abenaki Nation. Plague struck the aboriginal people in New England in 1616- 1619 decimating their numbers by tens of thousands. Already weakened, smallpox swept through like wildfire in 1632 – 33. We know from the General Court Records of the Mass Bay Colony of 1646 that an individual named “Roger the Indian” was living with a contingent in the Andover area, as negotiations with local Sachem Cutshamache for additional land included an acknowledgement of Roger’s pre-existing fishing rights. The fate of Roger is unknown. Where was the first settlement in town? The first meeting house, which served as the gathering point for the community for all purposes, religious and secular, was constructed on present day Academy Road. The first burial ground was laid out beside the structure and still is there to this day. Along present day Court Street, houselots were laid out, and there was a common grazing area for cattle and a training field. What was Andover like in 1715 when the Parson Barnard House was built? In 1715 Andover had been in existence as a town for approximately 75 years, it was a settled area populated with the third and fourth generations of the founding families of the 1640s. The town of Andover split into two parishes in 1709, North Parish and South Parish. In 1714, 121 new proprietors where noted in the town minutes, it was a growing community with a mills for lumber, grist (flour), and Henry Gray had a mill for ‘grinding scythes’. There were common grazing areas and a training field (for military duty). A school was opened about where Bertucci’s restaurant is today. There was no “downtown” as we have in North Andover (North Parish), or Andover (Parish) today. And the roads, noted historian Abiel Abbot in 1829, were crooked, and arose at first from the simple need to get from one homestead to the next, often they “were formerly closed by gates and passed through pastures and fields.” People walked to get from destination to destination, rode horses, or took a ferry. The area was not considered completely safe – in 1704 four “blockhouses” were built along the Merrimack River to protect the fields and inhabitants from Indian raids. In 1722 the town voted to build another blockhouse, and repair three of the existing ones. Israel Howe of Ipswich was offered a grant of land by the town in 1718 to induce him to move here for “the practice of physic”. He was one of the town’s first professional doctors, and he chose to settle in the South Parish. Dr. Nicholas Noyes followed in 1825 and took up residence in the North Parish. What was Andover like around the time of the American Revolution? The road infrastructure began to see improvement as the town invested in a plan to straighten and widen the roads, although the first “turnpike” from Medford to Concord, N.H. through Andover would not open until 1806. In 1775, dysentery came to Andover, and affected over 200 people, 56 of them died from it. In a time without clear models of hygiene and a lack of modern medicine, severe diarrhea could be fatal. By 1790, when the first official census was taken in Massachusetts, the town population was reported as 2,863, only up 425 people from 1765. That is less than 1% growth per year, so years of war and disease had had an impact. Perhaps this explains the sleepy rural scene painted by the Rev. Dwight of a disparate group of farmsteads, but on the horizon, Andover was on route to flourish. What was Andover like during the Industrial Revolution? Andover now had three parishes, the North (1645), the South (1709) and the West (1826). The population had nearly doubled to 4,530 people in 40 years. At this time it was the largest town in Massachusetts, comprising today’s towns of North Andover, Andover and South Lawrence. The industrial era was underway, the Schofield mill (1802) and Stevens Mill (1814) were operating with the Hodges (North Andover) mill to soon follow in 1839. Andover had its first town map published by Moses Dorman (copies for sale in our gift shop). The Andover Free School, renamed the Franklin School in 1803, had opened its doors to both boys and girls in 1799, the first school of its kind to do so in Massachusetts. Abiel Abbot reports in his history of 1829 that the school at the time enjoyed a “reputation inferior to none, and has never been more flourishing”. 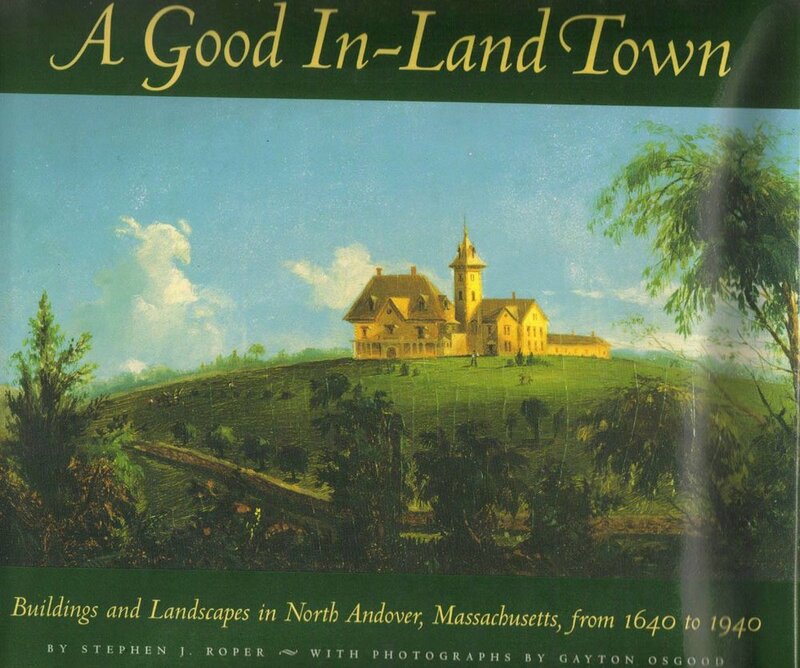 Recommended book by Stephen Roper is available for purchase in the North Andover Historical Society Gift Shop which is open Tuesday - Friday: 10-3.